Paid Dandelion Chocolate a visit the other day. I have bought their Chocolate in Bi-Rite, Local Market and their Ferry Building location. This is the first time I check out the Mission location. Dandelion Chocolate is a fine single origin chocolate maker based out of Mission, SF. They like to make their chocolate without cocoa butter. It is a nice space where you get to watch the chocolate production from behind the glass. Next to the glass is a long counter and stools where one can sip chocolate and read a book. In the front near the door there are also some ‘picnic tables and benches’. For the non-packaged chocolates, one places the order, for things like chocolate, coffee and brownies near the picnic tables. The packaged chocolate is next to the door. They make ample samples available for almost all the bars they sell. That day they were out of a couple of flavors. Make sure you have self control or you will be eating more samples than intended. Unlike the ferry building location where the samples can get wiped out by the market crowd like locusts descending on crops, it was a bit more ‘tranquil’ here. Individual bars were available. There was also a gift pack with three bars made of beans from specific regions in Venezuela, Dominican Republic, and Madagascar. Those were a bit cheaper than buying them individually. They also had a 100% Ecuador. While the flavor was complex and nuanced, I must admit I am a bigger fan of their other offering that has sugar in it. They also recently started offering a Guatemala bar. There was also a bar from Liberia. In addition to chocolate, I also got the brownie flight- three brownies made from chocolate from different regions of the world. I enjoyed the brownies and they each had very distinctive flavors, though I think I enjoy their chocolate in the bar form much better, as that is chocolate in its purest form. They also offer tours in this location on the chocolate making process. I hope they meant without ‘added’ cocoa butter ! yes I meant no ‘added’ cocoa butter! thanks. 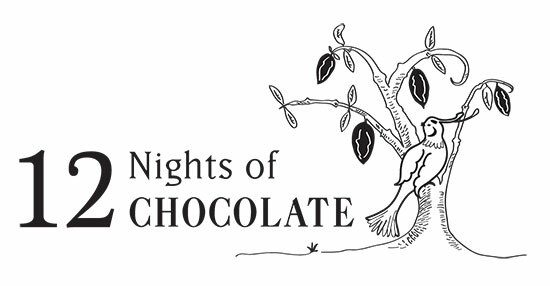 12 Nights of Chocolate event at Dandelion from Dec 2 to 13. The first night with Dominique Crenn, Traci des Jardins, Belinda Leong and Allan Murray is sold out.